Palette Mix 4 is a puzzle with 4 square pieces. 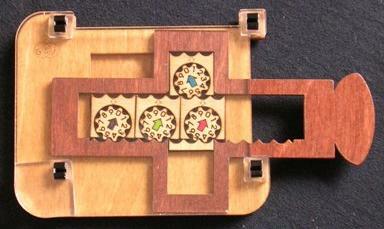 The pieces lie inside a 2×3 base, and are also held inside a cross-shaped frame. The top and bottom arms of this cross can hold only 1 piece, and the left and right arms a 1×2 square of pieces. By moving the frame horizontally or vertically, the pieces are moved about the 2×3 rectangle. To complicate matters, each piece contains a cogwheel with 10 teeth. The frame has teeth along the inside of its bottom edge, as do the tops of the square pieces themselves. As you move the frame around, the cogs engage the frame and rotate. Each cog has a coloured arrow on it. When solved, all the arrows should be pointing upwards, with the blue arrow on the top row on its own, and the bottom row containing black, green, and red in that order. There are 4 pieces and, as with any puzzle that essentially only uses plungers to move the pieces, only even permutations of the pieces are possible. This gives 4! / 2 = 12 positions of the colours for any frame position. Any arrow can be twisted any amount without disturbing anything else. Each arrow has 10 possible orientations, so there are 12·104 positions of the pieces in the frame. The frame itself can be positioned in 2×3 = 6 ways, so there are really 6·12·104 = 720,000 positions. I have used a computer to calculate God's Algorithm. The results are in the two tables below. Each table uses a different definition of what constitutes a single move. PuzzleAtomic.com is the homepage of Douglas Engel, the inventor and manufacturer. Sliding the frame left or right by exactly one tile is denoted by L or R respectively. In the same way moving it up or down is denoted by U or D.
Move frame to the bottom-left position, so that single piece in the top row is at the left. Repeat the sequence RULD until the black dial is in the bottom left corner again and has number 4 at the top. You may have to repeat the moves up to 27 times. Note that if the black dial shows 1, 2, 5, or 8 then it will be quicker to repeat URDL instead. Do RR to move frame to the bottom-right position. Note that the black dial should now show 0 as required. Repeat the sequence LURD until the green dial is in the centre of the bottom row. Repeat the sequence LURD until the green dial is in the bottom centre location again and has number 0 at the top. You may have to repeat the moves up to 27 times. Note that if the black dial shows 3, 6, 9, or 2 then it will be quicker to repeat ULDR instead. The blue and the red pieces should be at their correct locations (blue in the top row, red at the bottom right), and only need to be twisted to the correct numbers. Repeat until the blue dial is correct. Repeat until the red dial is correct.